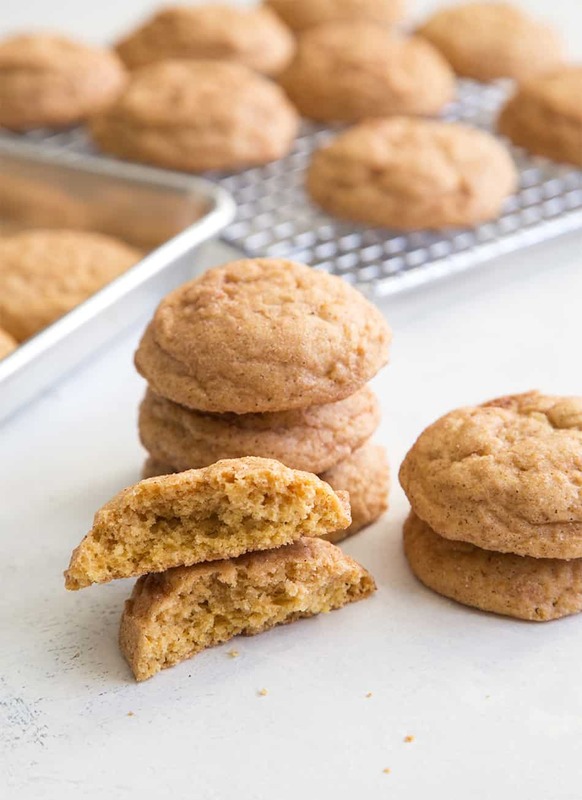 Pumpkin Snickerdoodle Cookies: all the familiar autumn flavors of pumpkin pie in a convenient handheld dessert! Solution: you recreate the flavors of pumpkin pie in a different form of dessert. Meaning, you make enough pumpkin snickerdoodle cookie to prevent anyone from noticing the absent pumpkin pie. Alex loves all things pumpkin (pumpkin bread, pumpkin rolls, pumpkin cake) and all things pie (blueberry pie, caramel apple pie, strawberry pie) but he can’t stomach pumpkin pie unless it’s covered with enough whipped cream to make it unrecognizable. It’s the texture of pumpkin pie that irks him. That moist, custard-like texture without the richness of flan that throws him off. 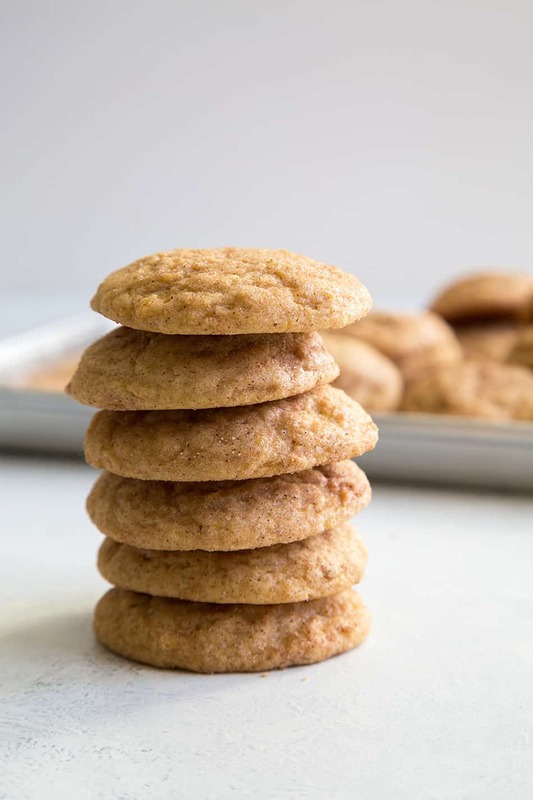 These cookies take all the familiar spices of pumpkin pie (cinnamon, ginger, cloves, and nutmeg) and packs them into a snickerdoodle cookie. Growing up, snickerdoodles were my FAVORITE (more specifically the ones from Mrs. Field’s). While snickerdoodles are delicious year-round, I love them the most during the holiday season. There’s something so warming and comforting from the mixture of cinnamon, sugar, and butter that makes me do a little happy dance. 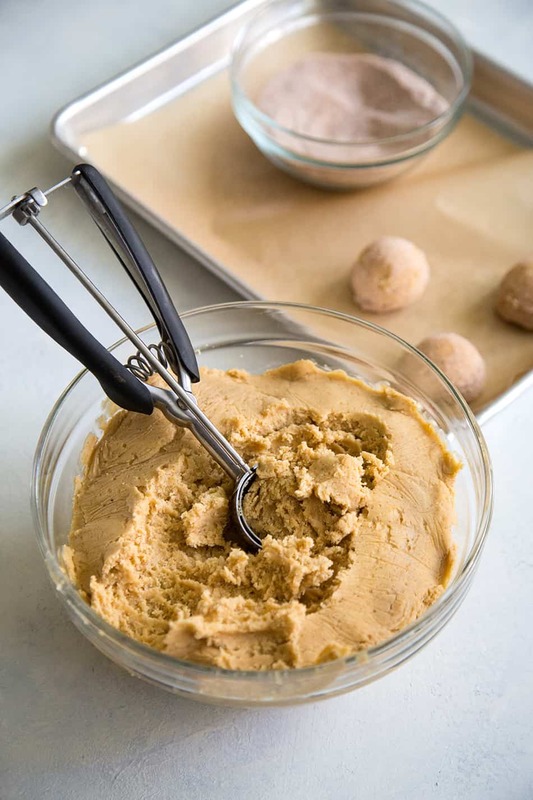 While this cookie dough is super easy to mix together (no mixer necessary), the dough does require a little chill time. How do you like your cookies? 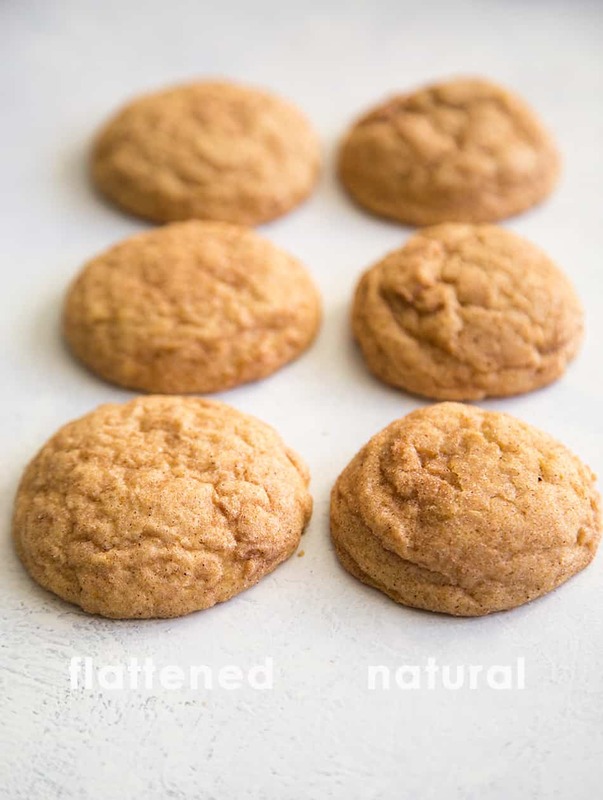 You can bake these pumpkin snickerdoodle cookies two ways: flattened or natural. You can gently flatten the cookie balls to create a more even cookie. They’ll be crisp on the outside and a little soft on the side. Or you can simply bake the cookie balls as is for a more puffy cookie that is crisp along the edges and cake-like on the inside. Either way, they’re delicious! They’re perfect for making ice cream sandwiches. And in my opinion, they’re fabulous for breakfast with a cup of coffee. And who knows, maybe a few batches of these cookies will convince pumpkin pie haters to give pumpkin pie a second chance! In a mixing bowl, cream butter and sugar until smooth. Scrape down bowl as needed to ensure thorough mixing. Add pumpkin puree, vanilla, and egg. Mix until combined. In a large bowl, whisk together flour, baking powder, baking soda, cream of tartar, salt, pumpkin pie spice mix, and ground cinnamon. Add to butter mixture in three additions. Mix on low speed until there are no longer any dry streaks of flour. Cover dough and keep chilled in the fridge for at least 2 hours until dough is firm (or up to 24 hours). Preheat oven to 350 degrees F. Line baking sheets with parchment paper or silicone baking mats. In a small bowl, whisk together sugar, spice mix, and cinnamon to make sugar spice mixture. Set aside. Using a 1 1/2-tablespoon cookie scoop (#40 scoop), portion out chilled cookie dough. Roll cookie balls in sugar spice mixture until fully coated. Place cookie balls 2-inches apart on prepared baking sheet. For flatter cookies: gently press the cookie balls with the palm of your hand or the bottom of a drinking glass. Bake for 8-10 minutes until the edges of the cookies are set. Allow to rest in baking sheet for 3 minutes before transferring to wire rack to cool. Enjoy cookies warm or at room temperature. For natural, puffier cookies: Bake cookie balls as is. Bake for 10-12 minutes until the edges of the cookies are set and the center of the cookies have puffed up. Allow to rest in baking sheet for 5 minutes before transferring to wire rack to cool. Enjoy cookies warm or at room temperature. *Use store-bought salt-free pumpkin pie spice mix or make your own by combining 2 tablespoons ground cinnamon, 1 1/2 teaspoons ground ginger, 1/2 teaspoon ground cloves, and 1/4 teaspoon ground nutmeg. These are perfect cookies for the season! My kids are going to love these! I do something similar on my Snicks…amp up with all kinds of spices. The BEST! 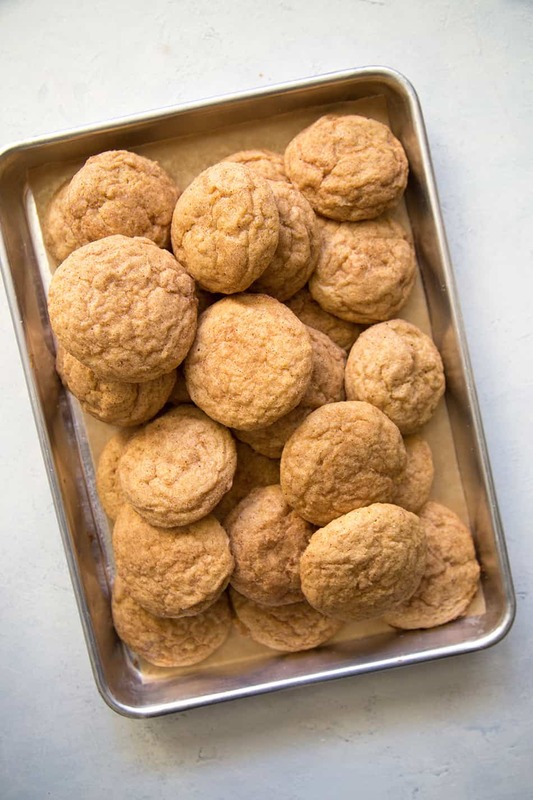 My kids love snickerdoodles, but these sound even better than the usual! These are perfect for fall! I can sink my teeth right into them! These will quickly become one of our household favorites!